Here is a pair of the famous 'traca-traca' toys, annually popular in Nicaragua during the months of April and May. You'll here the loud clackety-clack almost where ever you go and where ever there are kids and young people. The pair cost C$8 ($0.38) and make about 10x as much noise. Aquí está un par de la famosa 'traca-traca', popular todos los años en Nicaragua durante los meses de abril y mayo. Escucharás el ruido 'traca-traca' por todos lados, dondequiera que haya niños y chavalos. El juguete cuesta C$8 ($0.38) pero hace como C$80 de ruido. 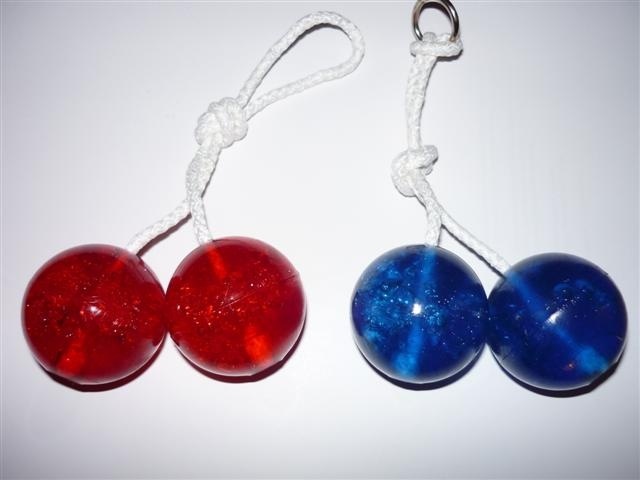 Clackers. I hate them. Yesterday my 16 month old neice was in her playpen doing a reasonable job clacking away. A perfect toy for this culture. Cheap, mindless, and noisy. We had 'em in about 1972. The grownups who hated them started a rumor that if you clack them too hard they break and release radioactive material. I remember them, they were called "clackers". I had a green one. I'm sure I was very annoying. Some say I still am!!! It's all part of the adventure!! I'm sure I was very annoying. Some say I still am!!! The only time one can be annoying is when one has been called down by your parents two or three times.